Radar hasn't found Air Malaysia flight 370, because it's not magic. Why Hasn’t Radar Found Flight 370? Because It’s Not Magic. Radar does its job well, but its infrastructure wasn’t created to continuously track commercial flights in real time. We all know what radar is. It’s that greenish line going around a bunch of concentric circles and making a pleasant beeping on a small monitor on a boat. And when there’s another boat nearby, it blips on the screen. Duh. But really—for many of us, it’s surprising that technology still hasn’t revealed what happened to the Malaysia Airlines plane. Shouldn’t someone be able to call up radar from around the time the plane disappeared, follow the greenish lines, and pinpoint the exact location? Yet there have been conflicting reports about what, exactly, radar has indicated about Flight 370—did it start to turn back? Did it end up somewhere around the Strait of Malacca? So what’s going on here? Here’s a radar refresher course. Radar—radio detection and ranging—consists of a device that transmits pulses of radio waves or microwaves. When there is an object in the path of the waves—let’s say it’s a metal lunchbox—they bounce off it, and a small portion of their energy returns to the receiver part of the device. That energy can be used to calculate things like the lunchbox’s position and velocity (if the lunchbox is, you know, in motion). This is known as “primary radar.” Primary radar is very passive and transparent. Your radio waves bounce off of me and tell you I’m there, my radio waves bounce off of you and tell me you’re there. Flight 370 wouldn’t have needed anything at all to potentially be detectable by primary radar. It just would have needed to be a big metal thing in the sky. Which it was. 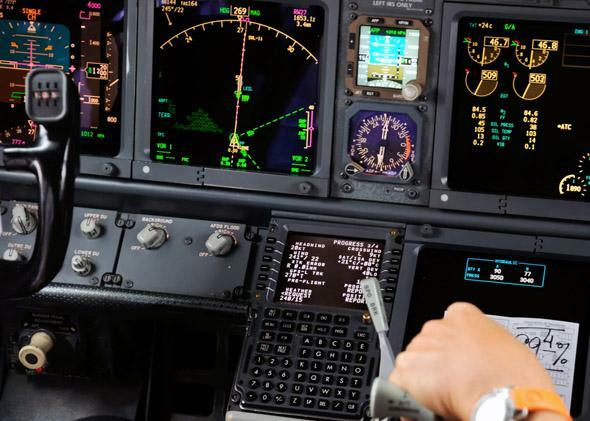 “Secondary radar” in aircrafts uses a transponder (transmitter-responder) to “interrogate” objects it detects, meaning it requests a four-digit identification code from the lunchbox. At the same time, the lunchbox requests an identification code in return, so the transponder transmits that code and receives the other. Primary and secondary radar complement each other by giving lunchbox pilots, and aircraft pilots, a map of nearby objects while also providing specific identifications. Secondary radar is more active in the sense that it requires an exchange (even though that exchange can be automated so pilots don’t have to do it). Though the range of secondary radar is limited and doesn’t cover the whole Earth (it’s especially spotty far over oceans), it seems that Flight 370 should have had sustained secondary radar communication. But its radar went off around the time it disappeared from other tracking as well. Almost every plane, including the Boeing 777-200 from Malaysia Airlines Flight 370, has an onboard system called Traffic Collision Avoidance System (TCAS). This system uses secondary radar to warn about potential collisions, but it’s only scanning locally. Commercial aircrafts can have things like weather radar or ground proximity radar, but they don’t usually have wide field radar in the air because they don’t need to know what’s around them unless it’s somehow a threat. [T]he fact is an aircraft can fly off radar. Once it gets over the water, radar coverage is not nearly as robust as it is on land. And, of course, if you go below certain altitude, because of the curvature of the Earth, radar can’t see you. And that appears to have happened here. Flight 370’s secondary radar seems to have been off around the time all contact was lost with the flight, but it’s unclear whether a power outage knocked the transponders out or someone turned them off. Conflicting reports about where the plane went next make the transponder outage seem either like evidence of foul play or simply a symptom of a massive system failure. A Reuters source in the Malaysian military says that the flight may have flown hundreds of miles after its last contact. This would indicate that the transponders were turned off and other systems were fine. But other sources deny this claim, or say that it is only one of many possibly scenarios being investigated. The solution to this tracking problem is complicated and limited by expense, because covering the whole Earth with secondary radar-extending towers, for example, is a much bigger job than covering the whole human-inhabited Earth with cellphone towers. Here on dry land it may feel like we’re being watched and monitored all the time, but if you dropped your (waterproof) iPhone in the middle of the South China Sea, Find My Phone wouldn’t be able to help you.